Seattle Opera invites schools participating in our Experience Opera program to attend final dress rehearsals, which are coming up next week for Le nozze di Figaro. It’s a great way to introduce young people, especially teenagers, to opera. But the important part of the introduction is actually happening now, in our many partner schools, where students are learning about opera, about Mozart and Le nozze di Figaro, in preparation before attending the show. (I had a great time the other day heading out to South Kitsap High School, in Port Orchard, to help introduce the opera to a terrific Humanities class.) The key to enjoying anything in life is understanding, and there’s a lot about attending an opera like Figaro that a first-time might not understand. We find that preparation exponentially increases the likelihood that our student audiences will enjoy themselves and have a positive first experience at the opera. 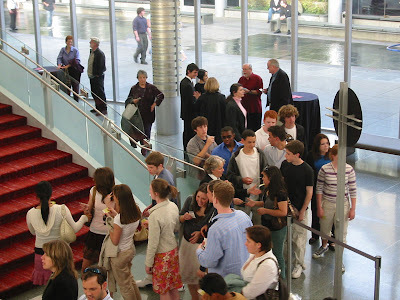 Above, students flow into McCaw Hall for an opera dress rehearsal. At our Teacher Training Workshops, we recommend calibrating students’ ears to Mozart, as it were, with a kind of lesson we’ve often found extremely effective. The idea is, you use the music of a Mozart opera to introduce what Aaron Copland liked to call the “Five Elements of Music”: Melody, Harmony, Rhythm, Color, and Form. Mozart is sending us messages with every note of his opera music; to figure out what it is he’s saying, you have to listen carefully, which means analyzing the music in terms of its five elements, asking yourself exactly what’s happening in that music. The teacher gets the students to define and give examples of the five elements more generally, then provides a bit of music from a Mozart opera. Students then figure out what that melody, harmony, rhythm, orchestral color, etc. is saying about the plot, characters, drama, etc. In the process, the music pulls them into Mozart’s world. ...because Mozart’s choice to juxtapose these two extremely different rhythms in that finale embodies all the binary oppositions of Le nozze di Figaro, all the public vs. private, women vs. men, society vs. nature, servants vs. masters, indoors vs. outdoors, daytime vs. nighttime, etc. you could perceive. My favorite thing to do, when teaching this lesson, is to put students on the spot and make them sight-read Mozart! In any group of 30 or so high school students you usually have a couple performers who aren’t intimidated by pulling out their violin, or oboe, or heading over to the piano, and showing off their sight-reading ability. And Mozart’s music is so straightforward, they can usually do a credible job of communicating to their peers how the music goes. The class then tries to figure out where this music fits in, in the opera. But along the way they’ve obliquely learned a very important lesson: classical music like Mozart is not only to be found on a recording, it is to be made, and owned, by us all. Bringing in students does have an impact - I sat next to a young middle schooler at one of the "Pearl Fishers" nights. She had first seen/heard an opera on a school trip to the recent "La Boheme" production and was now completely enthralled. We had a lovely chat about our favorite tenors. I used to love programs like this when I was in school. Plus, getting the students involved in a discussion about the opera and breaking down the aspects of it into more manageable pieces is a great way to make opera-lovers out of them! I find it fascinating that the high-school aged students near me are almost always more courteous than the 20-somethings, too many of whom don't seem to realize how annoying it is to have someone near your seat who insists on chit-chatting, texting, and rattling wrappers during the music. If the high-school students have learned manners, how can we teach them to the older people?